Community Blog by Flegma // Thrust onwards! Game genres evolve, recombine and effectively die out as the time progresses. This is a "brief" look into one or three or four of those genres, one that I haven't seen many new titles in recently: flying games where gravity is an elemental danger. I don't know if there's a genre name for the supergenre I'm writing about. Subgenres include "Lander-clones" and "cave fliers and Thrust-clones". I imagine gravity shooters may just refer to cave fliers and similar, so this supergenre might just be something I came up with. Gravity is constantly a major feature and a danger: the player has to fight against it all the time. Rogue Aces (Infinite State Games/Curve Digital, 2018) is the latest example of one subgenre I don't know a name for. Then there are the "cave fliers" like Oids (FTL, 1987) and landers like Lunar Lander (Atari, 1979). But, let's start this from early on. Very early on. EDIT: Just to make this clear -- I've seen Rocket + Landers grouped in one genre (Lunar landers) on Wikipedia. Thrust, Gravitar etc. are cave flyers and Thrust variants on Mobygames, and what I believe to have been called gravity shooters. Sopwith and the ilk? No idea what their genre is. Merging all these and Spacewar! together is my own idea/definition in this blog. One of the best-known early video games (but not the first!) is Spacewar! (Steve Russell, 1962) that ran on DEC's (Digital Equipment Corporation) PDP-1. Yeah, this genre can be stretched all the way back to early 60s. The game is a two-player game where the players control spaceships trying to destroy one another. There's limited fuel, limited ammo and in the middle of things is a star that pulls on the ships. The physics model is Newtonian (no need to go all relative) like even in Elite: Dangerous (Frontier Developments, 2014), only in 2D. Without input to use thrusters, the ships would still revolve around the star, unless the orbit leads it to crash. Crashing into the star is, naturally, a Bad Thing. In other words, it's a top-down two-player shooting game with tank controls, inertia and the addition of the pull towards the star in the center. You can find online emulated versions of the game easily enough, like here, if you want to try it. 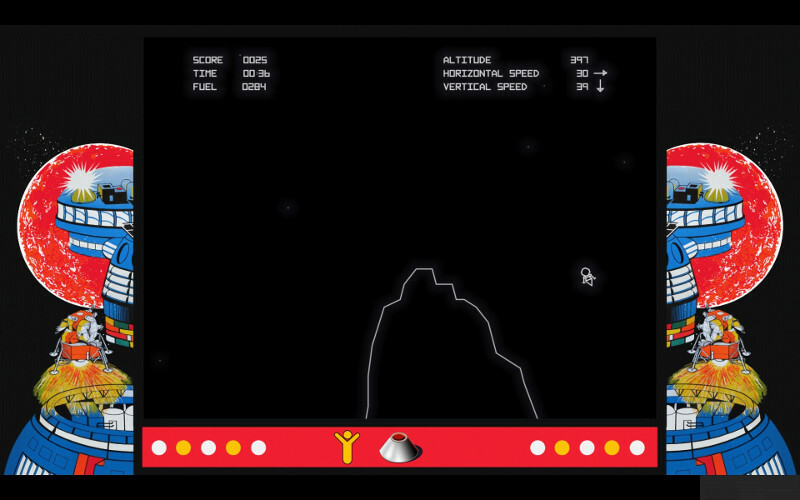 Emulated SpaceWar! as in the link just above. There are similar games -- this is similar to the melee combat in Star Control 2: The Ur-Quan Masters (Toys for Bob/Accolade, 1992), but that game lacks the gravity well in the center. In 1978, Atari released Space War for their Atari 2600 console; some game modes included the "space sun" in the center of the playing field. For a good look into the history of Spacewar!, Gamasutra had a four-page feature on the game in 2009. While Spacewar! might not have been on newspaper headlines (unless it was), the Space Race between the US and the USSR definitely was. The Apollo 11 mission in 1969 marked the time humans would first set foot on another celestial body -- the Moon. The lunar module, Eagle, touched down in July 1969. One tidbit of trivia: Neil Armstrong took manual control of Eagle's thrusters and landed it, and the landing computer wanted to reboot as that was happening. Before the year was over, a 17-year-old highschool student by the name of Jim Storer had written a game about landing on Moon around the time the Apollo 12 mission launched (source). The game has many names such as Rocket. The goal in Storer's game is to land the lunar module onto Luna safely. Sounds easy? The player will have only a limited amount of fuel and they give out the amount of fuel to be burned once per every ten seconds. 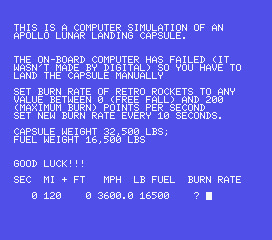 As such, the game requests the player only to type in the amount of fuel, after which it calculated the lander's altitude, velocity and the remaining fuel after those ten seconds. Repeat this until you've landed safely or there's a new impact crater on the Moon. While Spacewar! had proper graphics, it was typically limited to academic environments and actually developed at a university. Rocket used just the text mode. Despite the "graphics downgrade", it's still a fascinating game. Originally developed for PDP-8, the game was ported over to BASIC so that it could be run on multiple different operating systems: DEC, the manufacturer of PDP-8, accepted game listings and later published them. As it is, the program listing was in David Ahl's BASIC Computer Games, a book that had many similar simple game listings. I borrowed that book (or a later edition) from a local library in 1990s, but given how the games lacked graphics and sound, I didn't end up typing in many of the games. Given how the used BASIC was limited to the, well, basics of the BASIC language and lacked graphics and sound commands, the programs were easily portable to 1980s microcomputers. The biggest problem was that the games' output typically expected the screen to have 80 columns of text instead of, say, the 40 my microcomputer had. Program ROCKET adapted for MSX BASIC. The user input is under the "BURN RATE" column. The inputs are an example of a successful landing in 101 BASIC Computer Games (1975). And having now read the link on Armstrong's landing, the comment of on-board computer failing makes this far less imaginary... although that comment doesn't seem to appear in the original FOCAL source code. Something DEC added there, maybe? Obviously, once you know how to land the spacecraft, there's not much replayability as it is beyond either saving more fuel, landing more gently or landing more quickly. There were, however, variants that changed the initial velocity or altitude. USGamer had a fascinating article on various very early computer games, dating back to early 1950s. One common trait between the titles represented there were board games like tic-tac-toe: games that already existed and that could be played easily with another person taking the place of the computer. I would argue that of the games in that list, William Higinbotham's Tennis for Two (1958) was the first that clearly was not easily (or better) played without a computer. Rocket is a game that would't really work without a computer. While the calculation for each new round isn't that much, I doubt there are many people who'd love to calculate the updated velocity and altitude by hand. I don't know how well-known video games were in the late 1960s in schools, or to Storer in general, but I imagine being a game designer of any description in that time must've been harder than today, when there are many, many examples to show what a video game can be. This game is also interesting in how it took a big present-day event/newsitem and turned that into a game that was more constructive than a Flash game where Zinedine Zidane had to headbutt several players; I'm referring to the infamous 2006 World Cup event. For more information on Rocket, the game's original author, Prof. Storer, has a page of various documents and links about the game. Looking at the scan describing the game in the school "System Symptoms" and how another game/simulator was described there on the same scanned page, there appears to have been other examples of games available. Galaxy Game was an early coin-op video game that didn't move past the prototype stage. 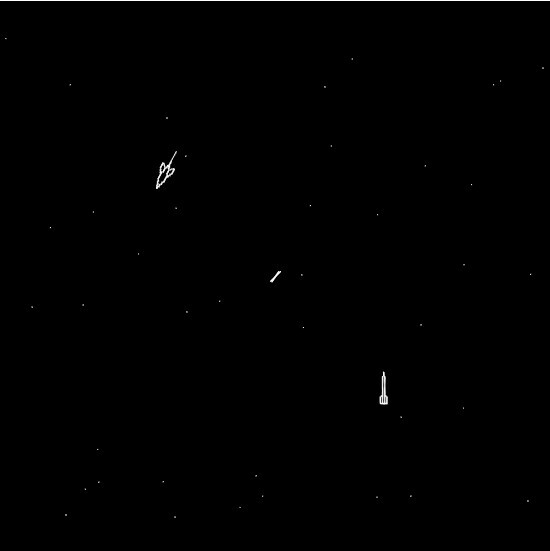 This game was effectively a port of Spacewar! to DEC's PDP-11 minicomputer ("mini" as in the computer cost about $25,000 or less). The developers didn't manage to make it a profitable venture, though: the cost to use a general-purpose computer for this was high. Nolan Bushnell and Ted Dabney's Computer Space (Syzygy Engineering/Nutting Associates, 1971) lacked gravity, but it was built using custom chips, which helped make the game commercially viable. These two people, Bushnell and Dabney, would go on to found Atari in 1972. Sidenote: I'm reminded of how Nintendo chose against using general-purpose CPUs in their Game&Watch devices. Ten years after Eagle had landed, Atari released Lunar Lander to the arcades. This can be perceived as a graphical action successor to the 1969 Rocket. Here, the lander moves in two dimensions. There are multiple platforms to land on, smaller ones giving better score. The screen actually scrolls and zooms in once the player's low enough. 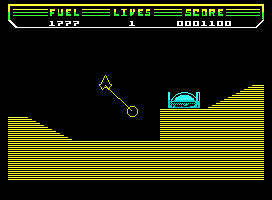 Screenshot taken in Atari Vault (Code Mystics/Atari, 2016) on PC. This is definitely not a fast-paced game: the thrusters' power changes slowly and preserving fuel is very important. Given how this is a coin-op game, the player could buy more fuel with coins, which makes this sound very much like a pay-to-win game if it just was played carefully. This happens pretty often. Not sure what the velocity units are, or if the size of the crater is exaggerated... Screenshot taken in Atari Vault (PC). While I understand the game wasn't a failure, it wasn't as much of a runaway success as Asteroids (Atari, 1979) was. Still, it's a well-known Atari title. For more info on the Lander genre, you can start from the Wikipedia page. In 1982, Gravitar took the weapon and flight mechanics from Asteroids and the gravity mechanics from Lunar Lander, but also expanded upon both. The result was a prototype called Lunar Battle, but the final game was called Gravitar. The blue polygon under the "N" in "NEXT SHIP" is the player's ship. This screenshot was taken in Atari Vault (PC). Gravitar is hard. Really, really hard. As with Lunar Lander, if your ship touches the walls, you lose a life. This time, the player also needs to collect fuel to keep their ship flying. This requires hovering over a fuel depot until it's drained. For the uninitiated, many (but not all) of Atari's early arcade titles did not use raster graphics but vector graphics. This means that rather than having the CRT display move the ray scanline by scanline, the ray moved freely in lines that made up the graphics. As such, the line graphics scale extremely well for emulation on higher-resolution displays. However, ports of the said games to early consoles like Atari 2600 look very poor. Vectrex is an obvious exception to the rule, given how it used a built-in display with the same concept. The microcomputers in early 1980s began seeing multiple Lander-type of games. There were, say, Jupiter Lander (HAL Laboratory/Commodore, 1982). Overall a disappointing title, I hear. Real-time lander-type games were, in the end, quite easy to program. I can imagine the need for animation being limited and the physics easy to implement (just add a constant to the vertical velocity every tick). Even the infamous Cassette 50 on C64 had a clone. This didn't mean there wasn't innovation it came to gravity-based games. 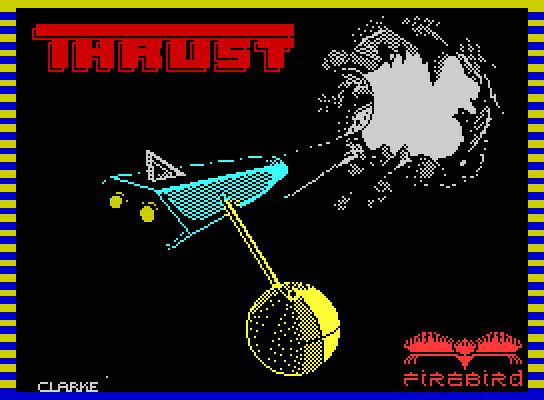 Loading screen for Thrust on ZX Spectrum. The novel idea in Thrust was to throw a spanner in the works. Well, the spanner being a massive ball that had its own mass and velocity hanging onto the ship by a rod, and would easily throw an unwary pilot's ship to the cavern walls. Or itself, which would also mean losing a life. To explain Thrust in more detail, the player's ship appears in air above the ground. The goal is to fly into an underground cave/installation. In there, the player's ship hooks up to a dense sphere and must drag it back up. If the ship hits the wall, the game ends. 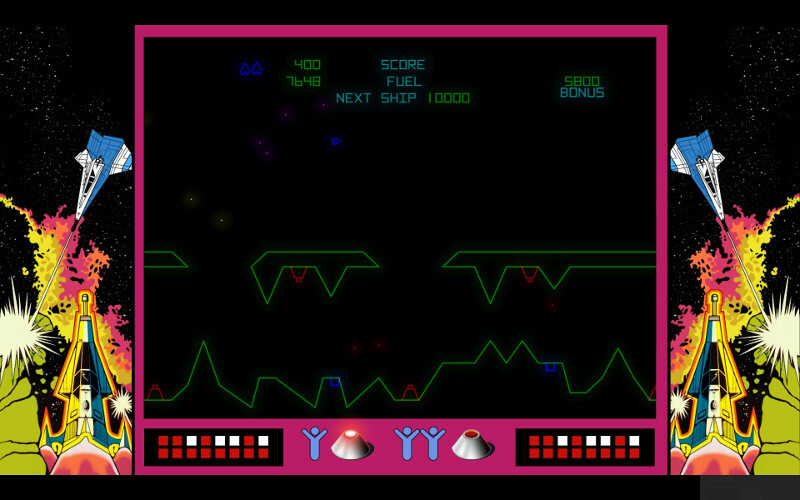 To further complicate the case, there are buttons to shoot to open barriers, turrets whose shots to avoid and fuel to scoop up, like in Gravitar. 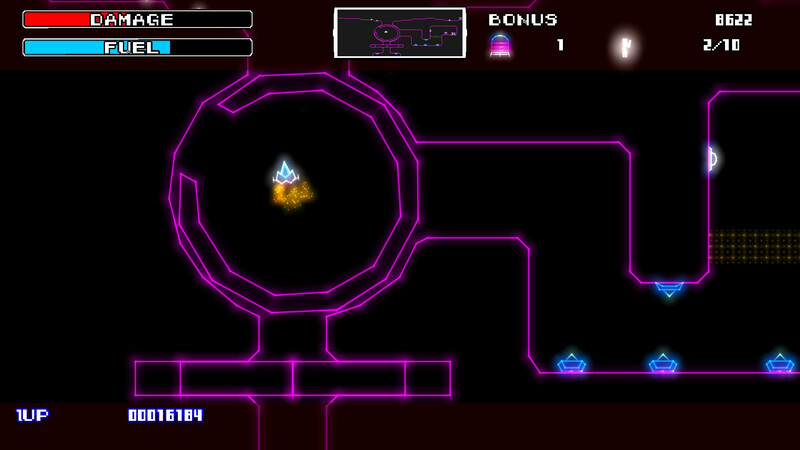 Carrying away the sphere in the first level. While I haven't played this game for more than a few minutes to take these screenshots, I hear that after the levels were cleared the first time, the gravity would flip around on the second playthrough. If the player beat that, too, then the walls would be invisible. And each time the ship contacted with the walls, it'd be a lost ship. Sometimes, fairness really wasn't the word you'd associate with games. If you don't believe, me, here's a tool-assisted longplay. Terrafire (ORT Software, 1997) was a MS-DOS shareware title conceptually similar to Thrust and much easier on the eyes in addition to being easier overall. If you don't mind working a bit with DOSBox, the game is nowadays free to download. Thrust itself got one sequel, and later a Thrust-clone called Zarathrusta (The Whiz Kidz/Hewson, 1991) was released on the Amiga. For NES fans, there's also one such game developed by Rare and Zippo games. This was called Solar Jetman: Hunt for the Golden Warpship, the third game in the Jetman series after Jetpac (Tim & Chris Stamper/Ultimate Play the Game, 1983) and Lunar Jetman (Tim & Chris Stamper/Ultimate Play the Game, 1983). Again, the player tows around heavy items: upgrades for the ship, money to buy better gear and most importantly fuel for the mothership to advance to the next level. 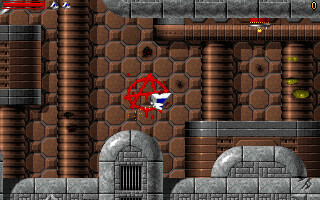 The loads could go inside walls, though, and the player's ship didn't explode of the first hit with the wall either. Unlike Thrust, the levels in this one were long. It was no longer a quick run to the bottom and back up again, but a proper maze that required multiple items to be returned to the mothership, parked somewhere on the surface of the planet. The ultimate goal was to collect all parts of the Golden Warpship, after which the last level would be a horizontally scrolling shmup. Solar Jetman also has a lot of extra additions to the standard formula. There are levels with water, where the gravity is inverted (the shuttle is buoyant). Special stages to collect points. 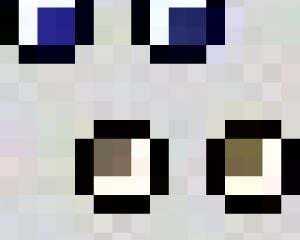 Powerups like better engines to purchase. Secret levels. Passwords to resume playing another day. All in all, not a game to dismiss in this genre. This game is available on Rare Replay (Rare/Microsoft Studios, 2015) on XBox One, if you're so inclined. On the 16-bit platforms, there are a few games worth mentioning. First on Atari ST there was Oids by FTL Games. The developers' main claim to fame was Dungeon Master (FTL Games, 1987), the archetype of 3D dungeon crawlers like Eye of the Beholder (Westwood Associates/SSI, 1991) and amongst the more recent titles, the Legend of Grimrock (Almost Human, 2012). As for Oids, the game design borrowed the idea of landing to rescue the eponymous droids from Choplifter (Dan Gorlin/Brøderbund, 1982). Destroy buildings holding droids, carefully land nearby, pick up the droids, take them to safety on the mothership in the sky. From what I understand, this was one of the few great Atari ST exclusives until lately when an Amiga port was released. However, Amiga owners instead had more multiplayer-oriented games in the Gravity Force series (1989-1994). In the 90s, there was a deluge of so-called 'cave fliers' in Finland. These were typically either freeware or shareware, didn't have computer opponents and were about cramming three people around one keyboard for a bout of dogfight. My own fondness for the genre originates here. Usually there were landing pads where the players could switch special weapons or (slowly) repair their ship. Sometimes, there were infantry that would shoot at the ships, or flowing water and lava. Levels were also often destructible to the same extent they are in Worms. Three people crowded around one keyboard? That's local multiplayer on PC. A few examples are AUTS (1995), KOPS (1996) and V-Wing (1997). The previous titles didn't consider the airspeed necessary to produce lift: the thruster at the back of the ship was enough. But there are also games that are a bit more "realistic" by taking airspeed into account: at too slow a speed, the plane can and will stall, resulting in a pile of debris on the ground. While that is a defining feature, there are multiple other frequent traits as well. If the plane flies too high, it stalls and crashes. This is common in the games that scroll only horizontally. Maybe this was an excuse to not include vertical scrolling? Bombs as "standard" secondary weapon. Whereas the cave fliers had a variety of imaginative secondary weapons, the inclusion of airspeed shifts the focus towards "realistic" weapons such as bombs and missiles. Of course, it's a very valid plan to drop a bomb on top of another plane, or drop all bombs while pulling back hard, effectively creating a fan of highly deadly ordinance for an enemy coming the player's way. Landing is even more difficult, since the player can run out of runway. I haven't seen this subgenre talked about with the Thrust- and Lander-clones, but I would argue that they're close enough to combine under the same umbrella. 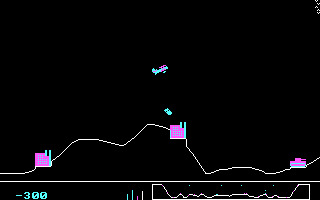 One of the first games in that genre is Sopwith (BMB Compuscience, 1984) on IBM PCs and its sequels. Starting with the second game, these even had multiplayer. 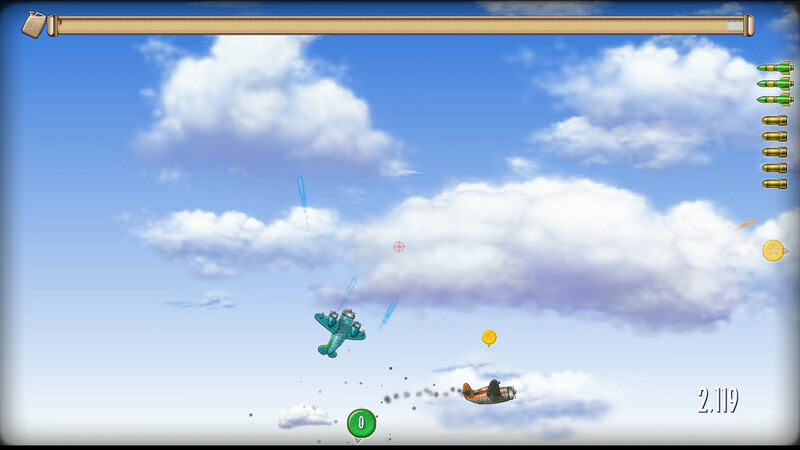 A screenshot of Sopwith 2. These have been available for free download for a while now, but they obviously require DOSBox to run on modern systems (and greatly reducing the simulated CPU cycles). Another old DOS game in this genre is Triplane Turmoil. Like Sopwith, the source code for this game is now available, but the releases on SourceForge and Github don't appear to include ready-to-run Windows binaries. The single-player campaign consists of a handful of missions each for four nations. The planes are all slightly different -- the Japanese can't carry much fuel but they have maximum bomb payload whereas the Finns have few bombs but the planes fly fast (and turn slowly). There were other games in this genre, but since I'm not familiar with them, I'll just drop their names. Wings of Fury (Broderbund, 1987) is one popular title. SkyStrike+ (Shadow Software/Atlantis Software, 1990) and Jetstrike (Shadow Software/Rasputin Software, 1994) are similar titles. You might also want to look at Rock, Paper, Shotgun's The Flare Path: Slightly Dead that looks closer into this subgenre with more games I had never heard of. Gravity-based shooters do not typically make big headlines nowadays, but the genre isn't quite dead. In 2017, I reviewed a Steam game from 2008 called Gravitron 2; of the subgenres discussed so far, this game is closest to Gravitar. In 2018, I wrote a blog about Rogue Aces on Switch, PS4 and Vita. This is a airspeed-based game. One of the better-known titles in this genre is Luftrausers (Vlambeer/Devolver Digital, 2014). Despite the player controlling a "regular" aeroplane, I consider the actual flight physics closer to Gravitar etc rather than the airspeed-based games. Retrobooster (Really Slick, 2014) is a gravity shooter as well, but the gravity, at least in the first couple of levels, feels rather low. I'm not sure how to feel about adding the reverse thrusters to the ship either. Pixeljunk Shooter (Q-Games/Double Eleven/Sony, 2009) is a cave flier without the gravity effect. Why did these genres decline? After Sub-Terrania (Zyrinx/Scavenger, 1993) on Megadrive, I am not certain if there were more games in these genres on consoles until PS3 and Pixeljunk Shooter, and even that game did away with the gravity. One obvious reason is that these are strictly 2D games. There is very little reason to make it harder for players to see how close the ground actually is by making the games 2.5D. Another problem is that these games are inherently slower-paced than, say, twinstick shooters without gravity. The ships' cannons aren't freely aimable either but they point forwards only. While I imagine a twinstick control scheme where the ship doesn't rotate like a tank would be learnable, it might be too much like patting the head while rubbing stomach at the same time. Still, some people liked Star Fox Zero (PlatinumGames/Nintendo, 2016). Moving these to full 3D would be difficult. I think David Braben's Zarch (1987) and its port, Virus, to platforms other than Acorn Archimedes, might be possible to be thought as 3D variants, but those were considered notoriously difficult in the magazines I recall reading. Lander (Psygnosis, 1999) is a possible "match" as well. Finally, I don't see this type of game well-suited for full-price physical distribution. I'm even surprised that Sub-Terrania was released on a 16-bit console, as games at the time were becoming bigger and larger, both in terms of content and features. There are many games I didn't mention -- say, Space Taxi (Muse Software, 1984) to start with. Have you played any of the games of this sort (other than Luftrausers)? How did you like them? EDIT: Added a notice near the top about this "supergenre" (the merging of SpaceWar!, Lunar Landers, cave fliers and what "Sopwith-likes" are) being my own invention/definition for this blog. EDIT: Rewrote the first paragraph to make the previous point more clear. EDIT: Due to today's discussion over what can be said of games one hasn't played, I'm listing here which games mentioned in the blog I've played at least ten minutes and those I've played significantly more with an *: Thrust (emulator), Rogue Aces* (Switch), Gravitar (Atari Vault), SpaceWar! (browser emulator), Ur-Quan Masters*, Space War (Atari Vault), Rocket* (MSX-BASIC adaptation), the Flash game with Zinedine Zidane, Lunar Lander (Atari Vault), Asteroids (Atari Vault), Terrafire* (MS-DOS, DOSBox), Solar Jetman* (NES), Jetpac* (ZX Spectrum Vega), Lunar Jetman (ZXS Vega), Legend of Grimrock*, AUTS*, KOPS, V-Wing, Sopwith 1 (DOSBox), Sopwith 2 (DOSBox), Triplane Turmoil* (MS-DOS, DOSBox), Gravitron 2*, Luftrausers* (PC), Retrobooster*, Pixeljunk Shooter*, Star Fox Zero*. EDIT: Clarified the makers of SkyStrike+ hopefully correctly, added a link to Rock, Paper Shotgun's article. EDIT: More fixes on 2018-04-30: Clarified that Rocket wasn't a "computer-assisted version" of a real-world game as opposed to being listed in the USGamer article; clarified that not all early Atari games had a vector display; added note of Galaxy Game being only a prototype; clarified Lander (1999) is only another possible 3D match; slightly expanded one suggestion why the genre has withered with what I intended to say but Salador wrote in the comments.